Media captionCollin Brewer said: "I will continue to apologise." A councillor who said disabled children should be "put down" has resigned. Collin Brewer, a Cornwall councillor, made the comment to a charity worker in 2011, saying disabled children cost the authority too much money. He made the comments to a Disability Cornwall member at a stall at County Hall in Truro. Mr Brewer said it was unlikely he would be a candidate in the May elections. "I was wrong, I admit it. I will continue to apologise," he said. 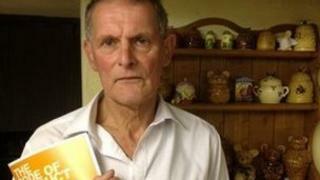 Steve Paget, the chairman of Disability Cornwall, said: "Finally he's seen sense and resigned. This situation should never have got to this stage." Mr Brewer's comments came to light following a report by the council's standards committee after the charity made a formal complaint. The committee ordered Mr Brewer to write an apology, which he completed. Theresa Court, who was on the Disability Cornwall stall, said she was "absolutely horrified" when she heard the "depraved comment". Another organisation in the county, The Foundation for People with Learning Disabilities, issued a statement saying it was "horrified". "Such irresponsible comments will have caused enormous anxiety and distress to many thousands of individuals and their families. We welcome Mr Brewer's unreserved apology, and believe he has done the right thing in resigning." Phil Wills from Truro, whose son Josh is severely autistic, said: "He's done the right thing. He didn't have any choice. "In any other job, you say that sort of thing, you would get sacked or suspended." A Facebook page called "Cornwall Councillor Collin Brewer should resign", set up in response to the council's report, attracted 3,692 supporters. Mr Brewer said: "It's very painful. I didn't sleep last night. I probably won't sleep tonight. "I'm not eating. I think it will live with me. It's continual regret." Mr Paget said: "I'm publicly calling on the council to provide disability equality training for all councillors. I'm appalled it has taken this long to reach a conclusion." In a statement Cornwall Council said it "takes its responsibilities around equality and diversity extremely seriously and is committed to ensuring that all staff and members receive appropriate training" and were "fully aware of the importance of this issue". "All members were offered equality and diversity training when the new Council was formed in 2009," it said. "Further training has been arranged in subsequent years, the most recent of which took place in December 2012."